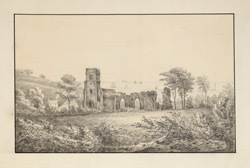 South-west view of the ruins of Overstrand church in Norfolk, showing its position by the sea. This medieval parish church, dedicated to St Martin, had fallen into ruin by the 18th century. It was repaired and partly rebuilt from 1911 to 1914.